Did you come to Vuly after your previous trampoline—for lack of a better term—fell apart? You might think that it’s the end-of-the-line for your dilapidated old trampoline frame, but like everything, your pre-Vuly frame can earn itself a second life. Although it’ll never be a trampoline again, you can still use it to create something useful or fun. We scoured the Internet for the best ideas on what to do with your old trampoline. There are some hugely creative people out there who have turned simple rings of metal poles and tubing into all sorts of clever constructions. This is one of our favourite ideas, and one that’s been around for some time. It has many different iterations—and even commercial versions—but they all involve hoisting your old frame up, and piling it with pillows and soft bedding. 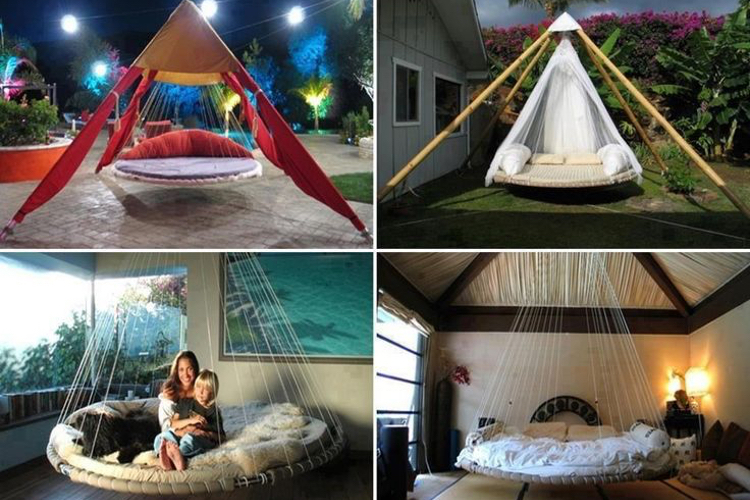 The bed swing is an especially good idea if only your trampoline’s legs have bent or become rusted. With a perfectly good frame, and a mat in reasonably good condition, you’re already halfway there! Just cut out a circular mattress, create a canopy from your desired material, and hang it onto a heavy-duty hook with ropes. Remember: Ensure that you can hang the swing securely, and that it can support your weight. Geometric patterns can be visually striking, and an old trampoline frame is the perfect structure for a centrepiece of climbing vines. 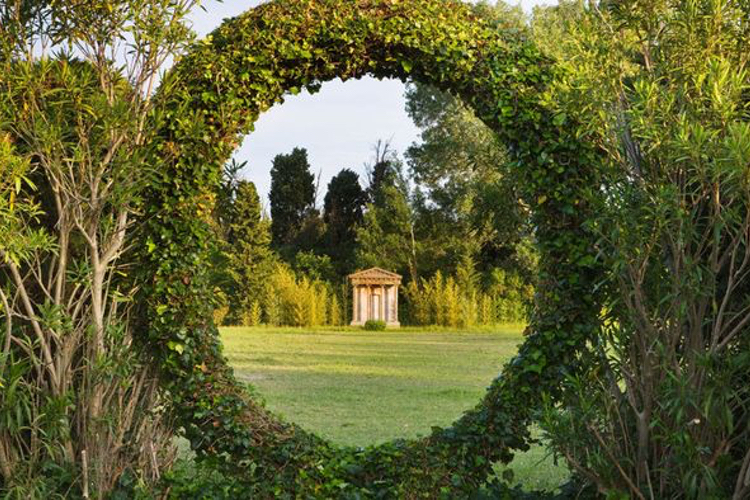 Although a large, open circle may seem unorthodox in backyard garden design, you can use it to create a ‘window’ into your garden, or tactically position it to ‘frame’ another feature of your garden, like a wall of hanging flowers. Garden rings work best when using small to medium-sized trampolines that you can reliably position vertically. It may take some time for the climbing vines to envelope your old frame, but when they do, nobody will notice that one of the most grand aspects of your garden used to be a sad, old trampoline. For the practical-minded, you can use your old frame as the starting point for a garden bed. 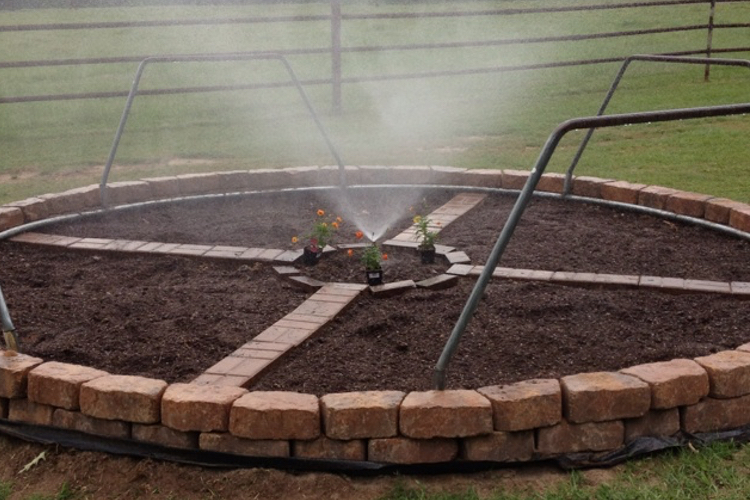 Circular gardens can be hard to get right, but they look fantastic and are efficient with a sprinkler placed in the middle. If you flip over your old trampoline, you have the perfect foundation for a well planned vegetable patch. Dividing the circle into ‘slices’ of different vegetables and herbs is a great way to get kids involved in planting and maintaining a garden. After all, who doesn’t want to tend a ‘pizza garden’? The trampoline garden patch works especially well where the legs are still in reasonable condition. You can use them to hang you tools, and separate your garden from the rest of the backyard. If you keep chickens, but don’t have an enclosed and safe space for them to stretch their legs, refashion your frame into a chicken playpen. Covering your old frame with chicken wire is a quick and easy way to ensure that your chickens have room to move. Try running a direct connection to the enclosure from your coop, so that they can enter when they please! Again, the trampoline chicken pen works best where the frame is in good condition. If you want to give your chickens extra protection from pets or other animals, dig around the perimeter a little, and extend the chicken wire into the ground. Did you have a trampoline before you bought a Vuly? Did you repurpose it, like we’ve suggested? Tell us about your great ideas on what to do with an old frame instead of throwing it away!